Start by preparing the sauce. Chop the onion and cook on medium heat with a drizzle of olive oil, until translucent. Meanwhile, remove the tomatoes skins and cut them into small pieces, or puree them in a food processor. Once the onion is cooked, add the tomato puree and tomato paste and let the sauce simmer for 15-20 minutes. Once it is ready to season with salt, pepper, and dried oregano. Add 1 tbsp. of olive oil and the chopped parsley and set aside. While the sauce is cooking slice the eggplants lengthwise, season with salt and let them rest for 10 minutes. After this time they should have released their moisture and are ready to cook. Dry them with kitchen paper before cooking them. Slice the mozzarella and set aside. Place a medium saucepan over high heat and add a drizzle of olive oil. Start cooking the eggplant slices, one minute on one side and 30 sec on the other, until all eggplants are cooked. While the eggplants are cooking preheat the oven at 200 degrees Celsius. 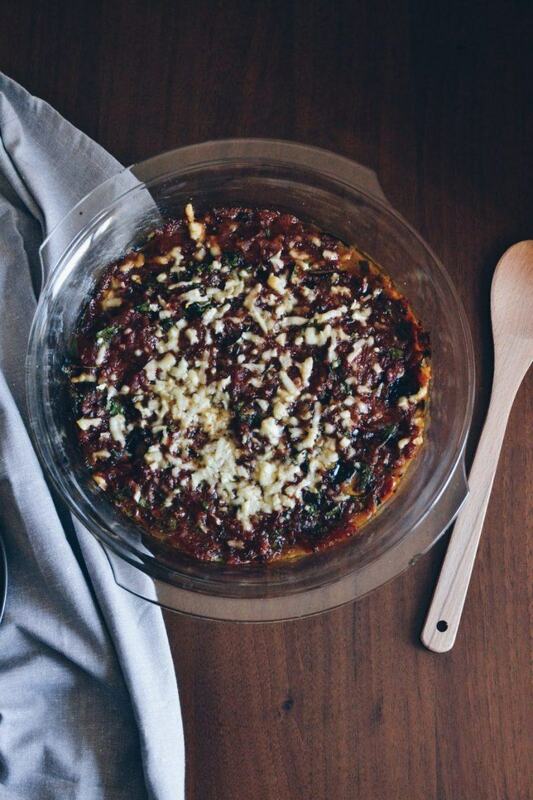 Take a 20cm x 30 cm casserole and create a layer of cooked eggplant slices. Add half of the tomato sauce and all the mozzarella slices. Add another layer of eggplants and top with the rest of tomato sauce. Add the grated parmesan, or any other hard cheese you are using on top and put it in the oven for 20-25 minutes. Let it cool slightly and serve.